Our favorite ramen at Tsukiji is Inoue. This tiny stall that has standing only tables for dining has been in business for fifty years. There is only one bowl that is made from (I believe) chicken and soy sauce broth, has thin noodles, and is topped with slices of pork, menma (bamboo shoots), green onions, and kaiware (daikon sprouts). The soup is light and a good start to the morning. This is a great start to the day, and in our opinion, better than having sushi for breakfast at Tsukiji as many of the sushi shops have become very touristy. There is usually a line here, so stand in line, order quickly, as the shop is run much like the Soup Nazi from Seinfeld. Stand and slurp quickly, and then move on to make room for the other diners. The hamaguri (common Orient clams) are from Kuwana in Mie prefecture. A region famous for its hamaguri. The Daisen chicken is from Tottori prefecture. The base to this bowl of ramen starts with excellent ingredients. The thin, straight noodles are made from domestic flour and are al dente. The toppings include a generous portion of refreshing mitsuba (trefoil) greens, and Daisen chicken. The yamaimo (mountain potato) and naruto (fish cake) is deep-fried in olive oil. On top of that, a half-dozen hamaguri clams. The tare is made from soy sauce and chicken fat. On the table is a jar of shallot oil which added even more umami to the bowl. The article mentions the branch in Ginza but we went to the Manseibashi store. When we left the shop was mostly women. The Manseibashi area is fun to visit as there are some great shops. Manseibashi is an old station in Tokyo that is no longer being used. The shops are under the tracks of the Chuo line. The bowl is full of umami and has a rich flavor of clams. It is obviously made by a trained chef using good ingredients. It also has a Bib Gourmand recommendation from the Michelin Guide. My favorite ramen at the moment is Kagari in Ginza. 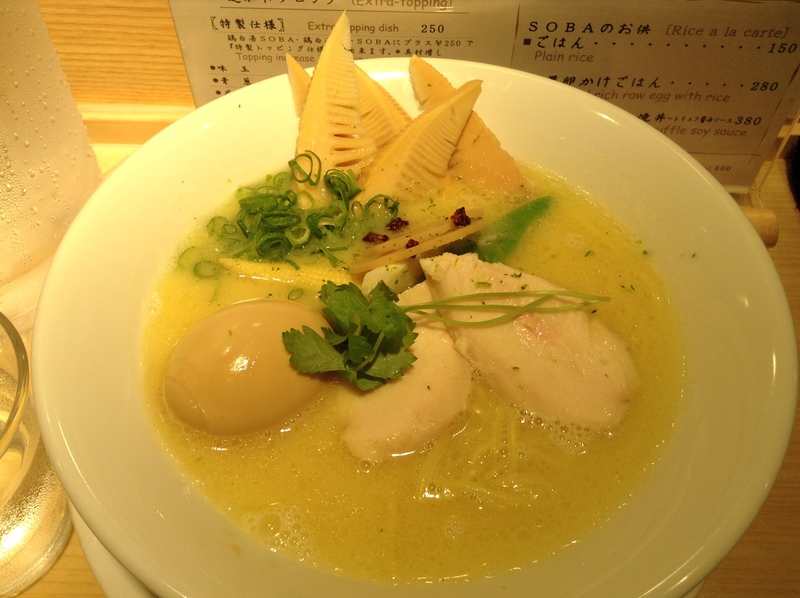 The shop does a tori paitan, creamy chicken ramen. This is perfect for those of you who don’t eat pork. 🙂 I come here mostly for the thick, rich soup made with lots of chicken fat. The noodles are thin, which I prefer. 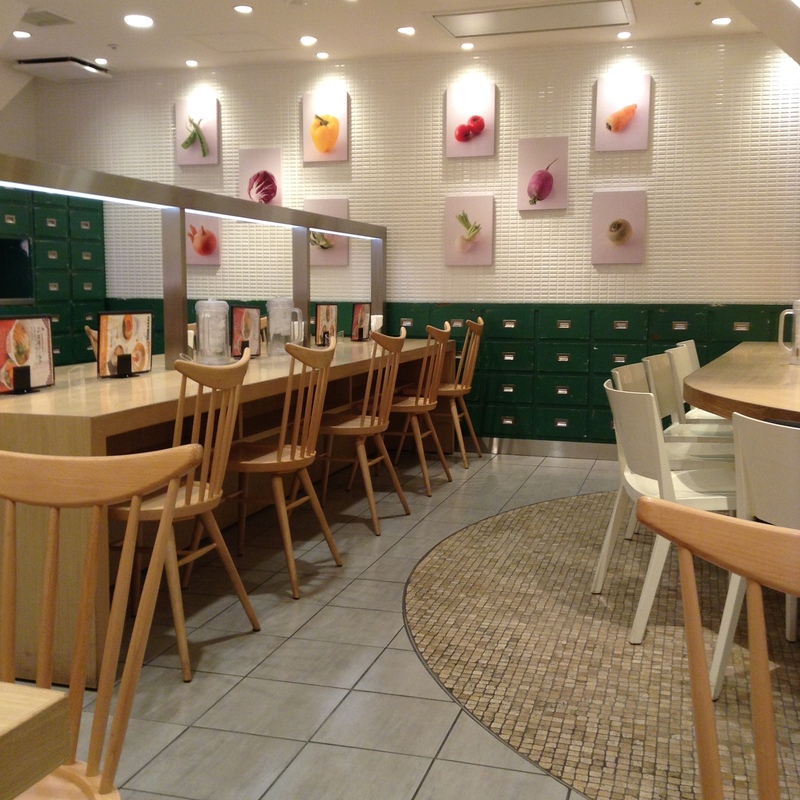 Recently Kagari has opened a second shop in the Ginza subway station in an area called Echika. It is close to the Marunouchi entrance to the Ginza station. The hours for this shop is 10 a.m. to 11 p.m. However, the staff said that best to come by 10 p.m. or you will be turned away. The Echika branch has only 8 seats at a long, straight blonde counter. This shop only serves the tori paitan, either a bowl of hot noodles with the soup, or as tsuke-men, where the noodles and soup are served in two different bowls. For optional toppings I included Kyoto bamboo shoots, aji tama seasoned egg, and garlic butter. The garlic butter in this shop was (I think) garlic powder mixed into butter. I also had a lovely bowl of seasonal vegetables as a side dish. Over a dozen types of seasonal vegetables, some raw some steamed, simple presented together in a bowl. It takes away a bit of the guilt of the hearty ramen when balanced with some vegetables. The vegetables could have been used as a garnish to the ramen, but it was a treat to try each vegetable and enjoy them for their own flavors. I came for an early lunch and was seated right away. In front of the shop is a waiting area. I would prefer to wait here in the hot summer as it is underground and not nearly as hot as waiting at the main shop. The main shop, honten, in Ginza is very popular. There is usually a long line at this shop. The sign outside of the store says “SOBA”, as the restaurant refers to their ramen as chūka soba, or Chinese noodles. One day while standing in line here a couple thought it was a soba shop and only once they were handed a menu did they realize that it was ramen. The poor woman said she was allergic to gluten but was advised that the ramen of course was made with gluten. They had stood in line so long that they came in anyways and all she could eat with rice with different toppings usually put over the ramen. The main shop also has only eight seats. The seasoned egg here was cut in half before being placed in the bowl, which makes more sense than serving it whole as they did in the Echika branch. Also, here the garlic is fried before it is added to the butter. The main shop also serves a niboshi shoyu, dried sardines and soy sauce, ramen. 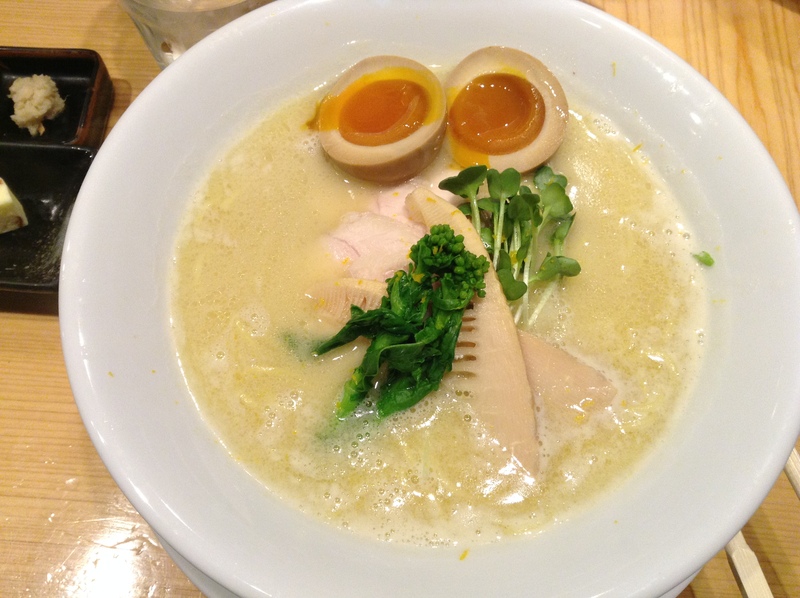 But come here for the tori paitan chicken ramen as this is their specialty. If you go to the main shop and the line is super long, I suggest heading over to the Echika branch. 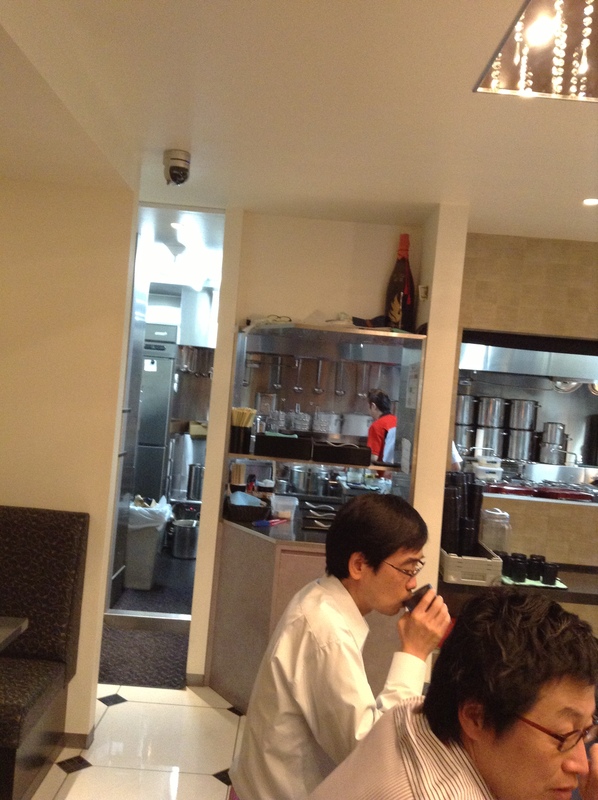 Also, the Echika branch is open without closing between lunch and dinner but the main shop does close for a few hours. The original shop in Ginza has closed along with the Echika branch in the subway station. The NEW shop is at and will open before the end of the 2018 year. Tsukiji Market breakfast options abound and oyster ramen (1,200 JPY) is one can only be had this time of year. 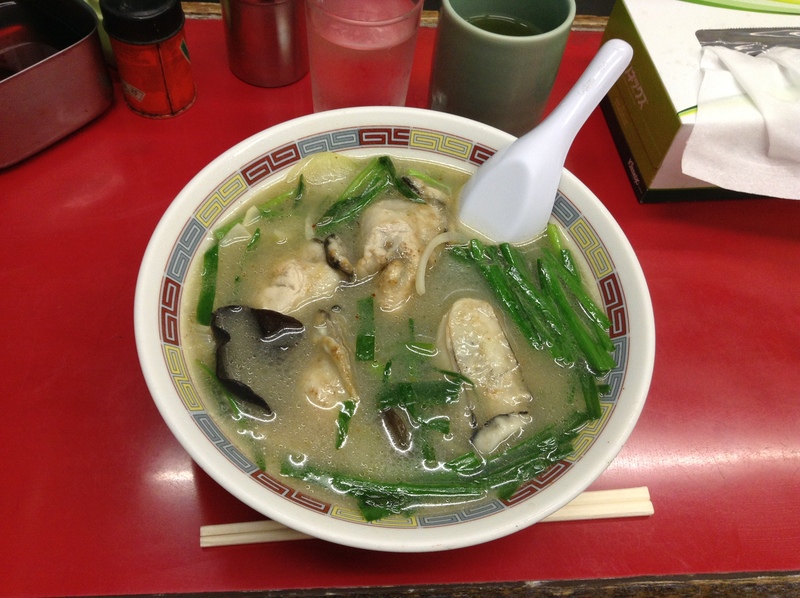 Creamy oysters are a unique topping for ramen and are served with nira (garlic chives), onions, bamboo shoots, and fresh wood-ear mushrooms. The noodles are straight and thin, a nice contrast to the large oysters. It’s a large bowl and very filling so come hungry, and come while oysters are in season. 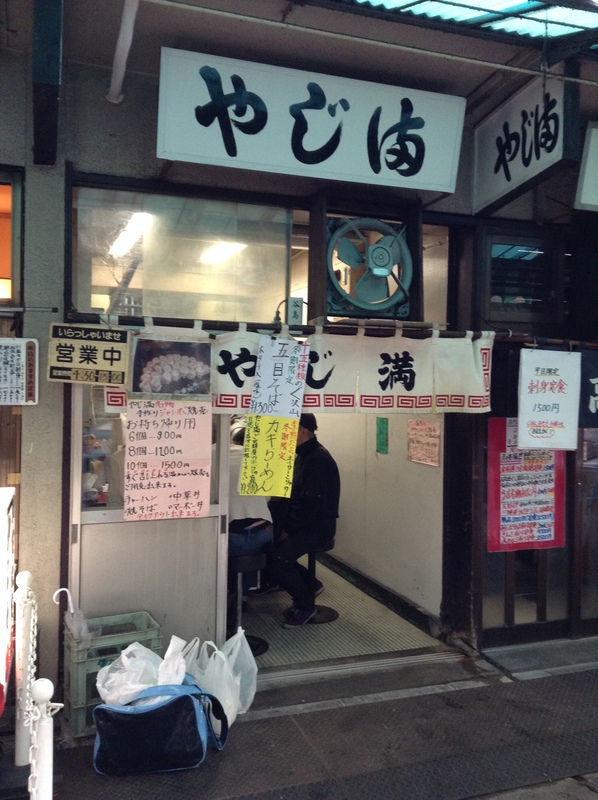 Most of the diners at Yajima are fishmongers from the inner market. Many of them were ordering fried rice or shio (salt) ramen and a half order of shumai (steamed pork dumplings). They are in and out quickly and pay when they order. It was the tourists (myself included) who ordered the oyster ramen (kaki ra-men) and paid after eating. I have a new friend in town who is a vegetarian. A while back when we got together for lunch I told her I would love to find a spot that we could have for lunch near her office. It was so frustrating to find someplace that was 100% vegetarian. While Japan has a rich variety of vegetables, many times it is cooked in a dashi broth which is usually made with kombu (kelp, a type of sea vegetable) and katsuobushi (smoked skipjack tuna flakes). I spent a long time searching and finally told her I couldn’t find anything that looked appetizing. There were a few places, but the cuisine just didn’t look appealing. Now I understand the frustrations that vegetarians go through when visiting Tokyo. Which is why I was so excited to happen upon a vegetarian restaurant inside of Tokyo Station that serves ramen along with many other dishes. The sign outside said no meat, no fish, no egg, no milk. But the photos of the ramen looked appealing. I sat down and confirmed with my waitress and she said it is 100% vegetarian. I ordered T’s tantan men, which seems to be a signature dish. The noodles were skinny and straight, as I like them. The broth was rich in miso but also full of umami. I added some of the condiment of red chili peppers and sesame seeds, although the broth on its own was a bit spicy. The location is inside of Tokyo Station on the first floor in a section called Keio Street. It opens at 7 a.m., which is when I went. After opening the shop the store filled up with a half-dozen diners. I will be back to try the vegetable curry which also looks good, but is not served at breakfast. The shop is brightly lit and the menu is filled with photos of the dishes, so ordering is easy for non-Japanese speakers. Rokurinsha’s tonkotsu tsukemen is one of the city’s most sought after bowl of ramen. 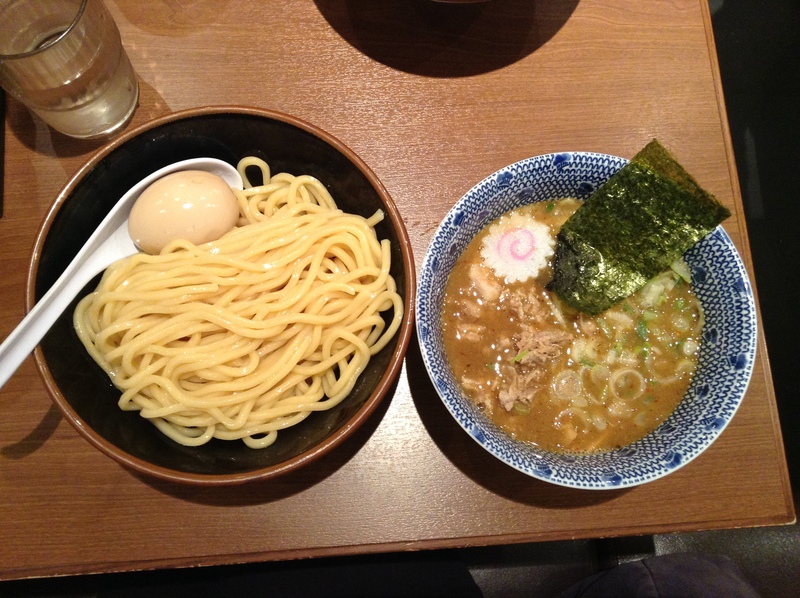 Tsukemen is an interesting way to eat ramen if you are not used to dipping noodles in a broth. In Japan we often eat soba, udon or sōmen with a smokey soy dipping sauce, so the concept is not too wild. Unlike the traditional bowl of ramen where the noodles and savory broth are together, here they are separate. Grab a few noodles with your chopsticks, dip in the broth, and slurp away. There is a spoon if you want more of the broth. Tokyo Ramen Street in the basement of Tokyo Station has eight ramen shops all lined up next to each other. Note that the basement shopping area of Tokyo Station is massive. Be sure to head to the Yaesu side of Tokyo Station. 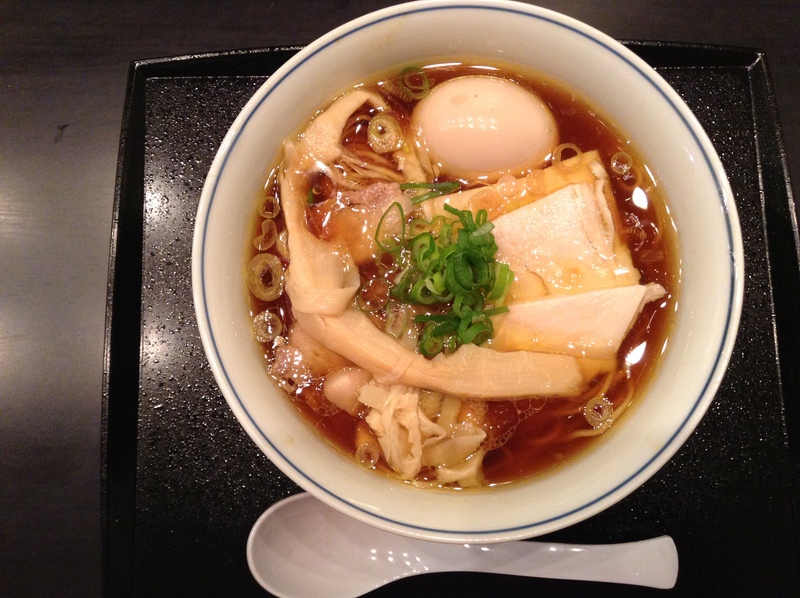 There is a map in English if you click below on Tokyo Ramen Street in the address section. I recommend it as a place to go to for ramen as you do have the option of checking out what the other shops offer and the location can not be beat. Most travelers in Tokyo will pass through Tokyo Station at some point. However, most people who come here want to join the line of customers waiting for a seat at Rokurinsha, which is by far the most popular ramen shop. The line is usually filled up with salarymen in white shirts and ties. But the same could be said for many restaurants in Tokyo Station as there are many train lines going through this station and the financial district is near here. Most likely you will want to order the ajitama-tsukemen for 950 JPY, which includes all of the basics as shown above, including the seasoned egg (ajitama). The umami-rich broth is tonkotsu, based on pork bones, and this is a meaty, in-your-face soup. As you can see, the toppings include a soy-marinated hard-boiled egg, a thin sliced of pink and white naruto fish cake, toasted nori, julienned leeks, and some pork pork belly. There were extra packets of powdered katsuobushi, smoked skipjack tuna, but the dish had enough flavor it did not need any more help. For some it may be too complex, the meaty broth and the smokey fish powder. The thick, straight noodles seem perfect for this dense broth. What some may not care for is the cold noodles being dipped into the hot broth. 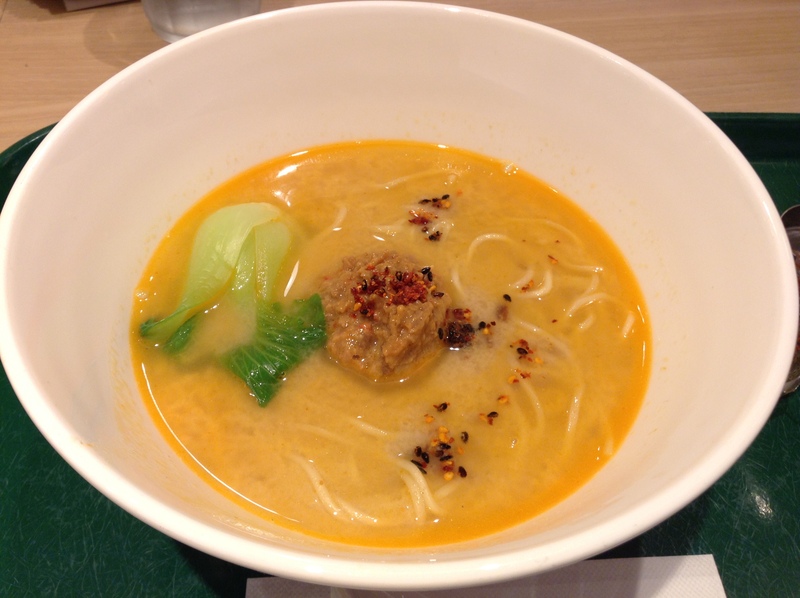 The temperature of the broth drops quickly and the fatty soup is not as enticing as when it is hot. Regardless, it is very popular and it’s rare that there is not a line to get in here, even first thing in the morning when it opens at 7:30 a.m. While here, be sure to pick up the regional flavored Kit Kats at the shop across the aisle. Details in this Metropolis article. So sorry, but a kind reader of the blog has just informed me that this shop is now closed. I will update this post when I hear of news of a new shop opening in central Tokyo. 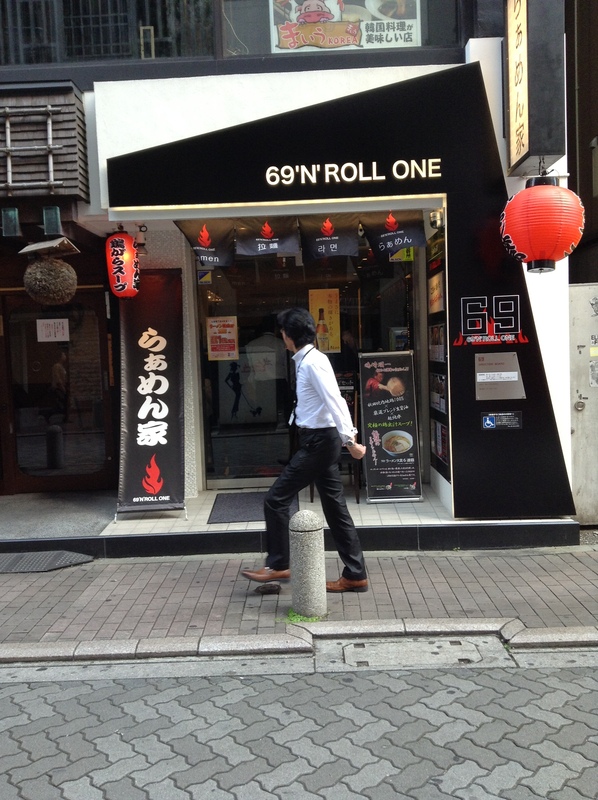 Rock’N’Roll ramen is spelled out with numbers 69, or “roku” in Japanese. So, in Japanese we call this ramen shop Roku N Roll, said quickly it sounds like “rock and roll”. 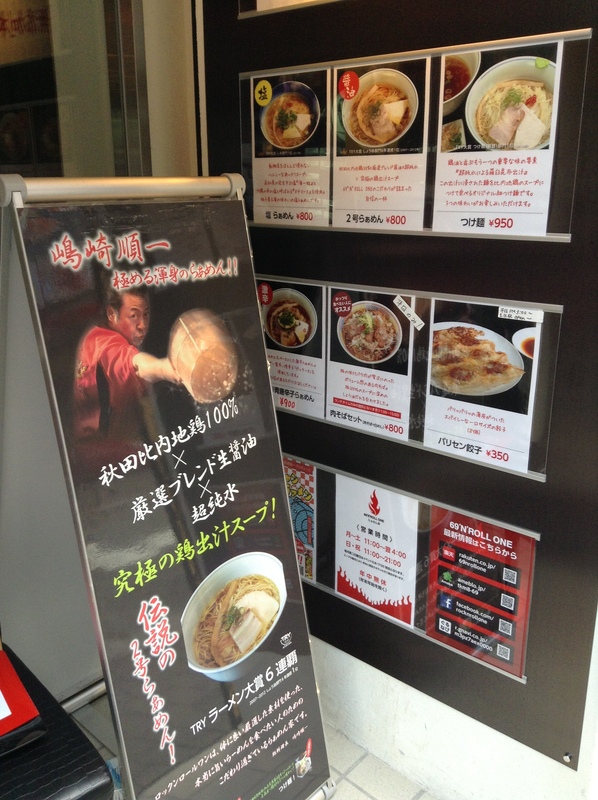 Chef Junichi Shimazaki’s original shop is in Machida and has been voted the best ramen in Tokyo for a few years. Machida’s a long haul from central Tokyo so I was thrilled when he opened up a shop in Akasaka in June, 2013. What makes his ramen so special? Many facets. The flour used for making his noodles is all domestic. 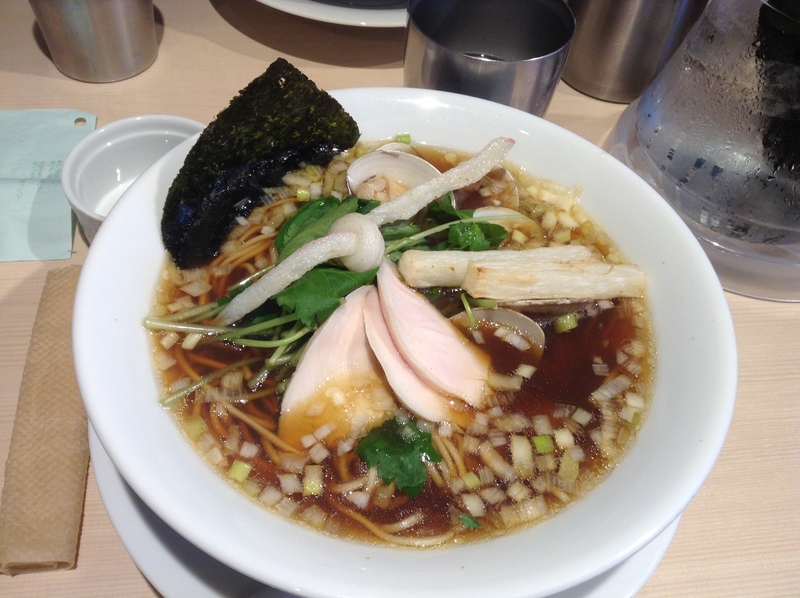 The broth is made from chickens from Akita prefecture. And the pork on top of the ramen is none other than Iberico pork. Some call this kodawari, an obsession to perfecting each component. It’s a great bowl of ramen. The broth, while a rich chicken flavor, is well-balanced and not too heavy. The pork was amazing. The noodles were cooked just right. The only thing I would change is that I wished that the egg was cut in half as it was hard to eat. He’s famous for his shōyu (soy sauce) ramen. Next time I’ll try the shio (salt). Shimazaki-san’s coiffure and dress is very 50’s, think the Fonzie, but with longer hair. Seeing his style, it makes sense why he calls his restaurant Ramen-ya Rock and Roll. It was great fun to see him in the kitchen making ramen. He’s very popular and is often seen on television and in magazines. The shop this day was filled with mostly area businessmen and young students. I went right as they had opened up and got a seat right away. But when I left there was a line. The gyoza on the menu looked great, but not available until later in the day.